As many of you know, this weekend is a historic time for nerds everywhere. On May 4th, The Avengers will be released for its theatrical run in the United States, the pinnacle of the Marvel franchise and a culmination of years of features for each Avengers team member. Needless to say, we’re pretty excited; in fact, Sayf Sharif went ahead and made a pretty extensive infographic that should prep you with all the information you need to know for the event. Captain America, a Nazi-fighting symbol of freedom and justice, is most definitely YouTube. YouTube is one of the most democratizing of the social media platforms available, offering anyone and everyone the ability to be a ‘YouTube Star’ or just to toss their two cents in on the current debate. YouTube is a platform available to everyone, offering equal opportunity for each member to speak – a true symbol of freedom, just like good ole’ Captain America. Need more proof? Just take a look at some of the most popular YouTube videos of all time – David at the Dentist, Numa Numa, Tron Guy – the list goes on, filled with average folks getting their chance to shine. How democratizing! The talented and intelligent Dr. Bruce Banner can turn from civil to savage when taken down the wrong road, and Twitter is much the same. Just like The Hulk, the Twitter masses can accomplish impossible feats of strength when moved to anger, like the uproar over the Trayvon Martin case or the Arab Spring movement. Similarly, like the Hulk injured his love interest Betty, Twitter has damaged and hurt people as well, like Rebecca Black, who had to deal with bullying after the viral success of her ‘Friday’ video. Thor is Pinterest. Why? Because the ladies love him. Tony Stark can build anything and do everything, which is exactly why Facebook is his social media parallel. With its extensive developer community and robust apps marketplace, Facebook has awesome tools and tricks to get more mileage out of you and your account. It also helps that both Tony Stark and Mark Zuckerberg are young and incomprehensibly wealthy. Black Widow’s parallel would have to be Instagram. Both in the comic books and movies she first appeared with Iron Man, as Instagram did with Facebook by showing up so often in our feeds. Her addition to the Avengers series enhances the power of Iron Man’s performance. This neatly fits into how Instagram enhances Facebook, and was in turn bought by it to be a permanent member of its company. Plus both Instagram and Black Widow look good, with or without filters. With his quiver filled with arrows capable of all kinds of feats and his unrivaled accuracy, Hawkeye is Foursquare. The location-based service touts its ability to deliver targeted offers and enhancements to businesses, just like Hawkeye can contribute an arrow for any occasion to The Avengers. 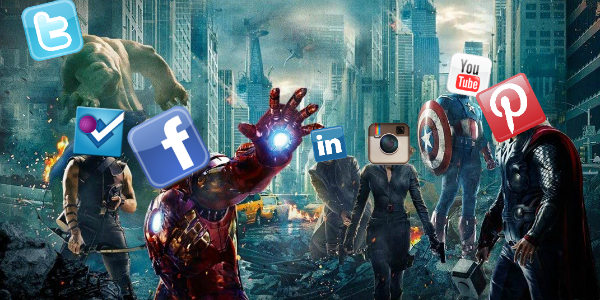 Just like Hawkeye, Foursquare is concentrated on accuracy above all-else, and delivers tools to augment that ability. Nick Fury plays more of a supporting role, and brings all of the Avengers together. Now what social network does that sound like? LinkedIn, of course. Fury’s focus is on networking, building the perfect team, and using tools S.H.I.E.L.D. has at its disposal to assist that team. LinkedIn, similarly, is focused on building professional networks and helping you make the most of those connections. What’s that you say? Warmachine isn’t in The Avengers movie? Oh don’t worry, we know. Warmachine wants to be Iron Man – he has all of the same types of equipment, but he’s just not as good. That’s why Warmachine is Google+, the social network with tons going on and no one there to see it. Think we got it wrong? Think we nailed it? Just want a large version of The Avengers image we made? Let us know in the comments.